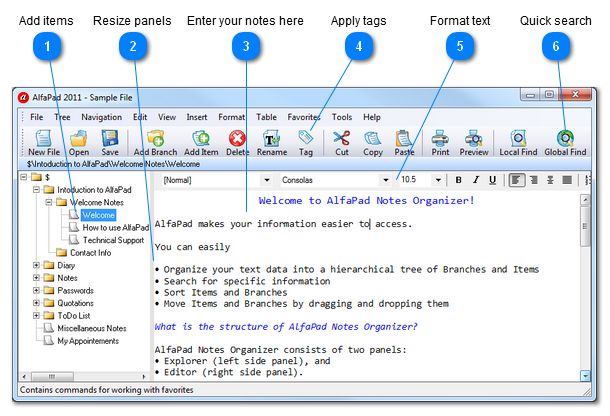 AlfaPad Notes Organizer uses an intuitive, double-paned Explorer-like interface to allow hierarchical storage of information. A graphical hierarchical display of your documents (branches and items) appears on the left, while a text viewing/editing window is displayed on the right. Other features include a toolbar, printing, support for multiple databases, font customization, and text alignment commands. Qweas is providing links to AlfaPad Notes Organizer 2011 as a courtesy, and makes no representations regarding AlfaPad Notes Organizer or any other applications or any information related thereto. Any questions, complaints or claims regarding this application AlfaPad Notes Organizer 2011 must be directed to the appropriate software vendor. You may click the publisher link of AlfaPad Notes Organizer on the top of this page to get more details about the vendor.